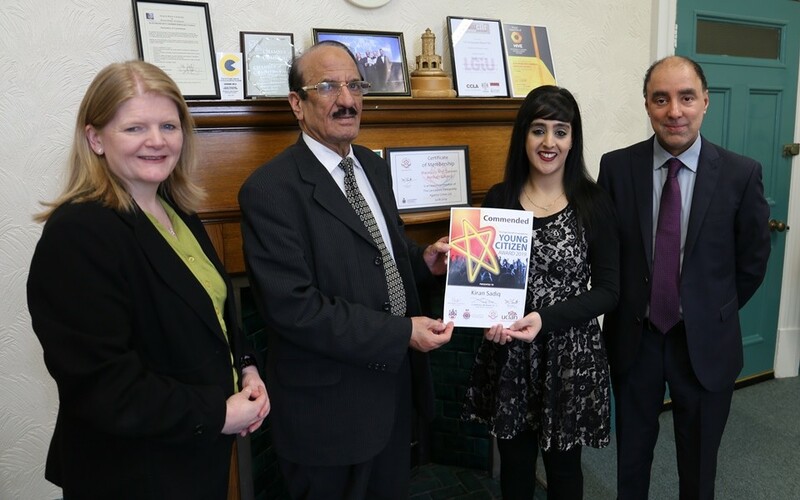 Kiran Sadiq, 26, from Blackburn, was nominated by the Leader of Blackburn with Darwen Council, Cllr Mohammed Khan for a High Sheriff of Lancashire Award. The awards recognise people who have shown outstanding commitment to Lancashire through either volunteering or from local public service. Kiran was nominated for her work with West End Girls, which is a group affiliated with One Voice. WEGs is a well known girls group in Blackburn which aims to empower young females, especially in the South Asian heritage community. The girls are aged between 10 and 18. Kiran has been instrumental in growing the group to 50 members who meet every week on a Sunday afternoon. After just missing out on the High Sheriff award, she was put forward for a Young Citizen Award in which she was commended. The certificate was sent to to Councillor Khan who presented it to Kiran along with Denise Park, Deputy Chief Executive of the Council and Zaffer Khan, Chief Executive Office of One Voice.